PEROU – Saltur - Excavators working at the Saltur archaeological complex have found a number of tombs, including an intact tomb of a female noble. According to Peru21, the woman buried in the tomb was around 30 at the time of her death, and was interred with a number of ceramic vessels, as well as the remains of several fish and birds. Investigators found her body posed with bent knees and her head facing southward. La Republica reports that the tomb is probably around 600 years old. Archaeologist Luis Chero told press that findings at Saltur and nearby sites could provide important information about ancient civilizations in northern Peru. Unfortunately, looters beat the investigators to at least one of the tombs in the area: “In addition to the presence of ceremonial architecture from the Lambayeque culture, we’ve round funerary sites at the dig where we’ve been able to identify four tombs from the Chimú period and one that’s probably from the Chimú-Inca period, but was profaned by looters and we’ve only been able to recuperate some offerings,” Chero said. 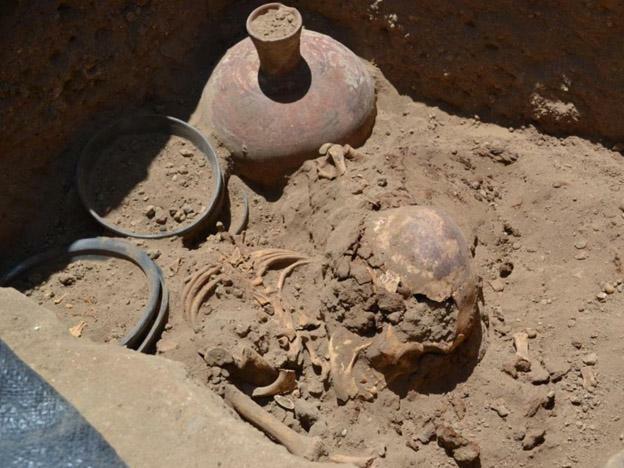 RPP Noticias reports that this is the first completely intact tomb that excavators have discovered at the site, as grave robbers have plagued the area for years. According to Peru21, there are 60 people working onsite at Saltur, and dig leaders estimate they they’ve excavated about 40% of the site. GRECE – Aghios Vassilios - A new excavation in the Xirokambi area of Aghios Vassilios west of Sparta, in the Peloponnese, Greece, has revealed a richness of Mycenean artefacts in the area, including the remains of a palace, Linear B tablets, fragments of wall paintings, and several bronze swords. The Aghios Vassilios excavation began in 2010, after Linear B tablets were found in the area in 2008, pointing to the existence of a powerful central authority and distribution system. The deciphered texts were devoted to perfume and cloth production, the trade of which was controlled by a palace administration in the Mycenean era. 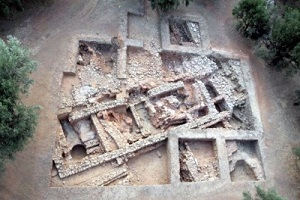 Evidence of a central palace administration was confirmed also by the architecture, which is dated to the 14th century BC, while contact with Crete was confirmed by the finding of a double axe, a feature of the island’s palace culture. Artefacts found include seals, a multitude of ceramic and bronze vessels, and 21 bronze swords. According to the evidence, a sudden fire that broke out either at the end of the 14th century or the beginning of the 13th destroyed the three buildings on the site which were never rebuilt at the same location. ISRAËL – Sussita - Archaeologists digging at Sussita, the ancient city of Antiochia Hippos, had been investigating the pipes that passed underneath the floor of the city’s public bathhouse when they discovered a modern bottlecap in its 2,000-year-old sewer system. Michael Aizenberg, head of the excavation team, says that the bottle cap indicates that the pipes are still functional and can carry rainwater even though the city had been destroyed by an earthquake. The team is still looking for a public toilet and the sewer’s upper opening. Other finds in the sewer system include bronze coins damaged from exposure to urine and ten bone dice. Aizenberg thinks that visitors to the public toilet probably enjoyed gambling.